The legendary Gulfstream G2 continues to bring comfort and convenience towards its long-range passengers. This 13 seat jet can fly you to as far as Prague, Finland or Switzerland if you’re coming from Toronto. Your chosen operator will also have its corresponding set of upgrades to meet the ever growing needs of private, high rolling travellers like you. With the prevalence of going digital, business and leisurely travelers alike can benefit from the upgraded interconnectivity features of this jet. A standard Gulfstream G2 will have WiFi so you can stay connected with your family, friends and professional networks. Upon climbing up the Gulfstream G2, you’ll find how its cabin’s interiors have a galley which includes small appliances and compartments to serve as pantries. Some of the small appliances include a microwave oven, coffee maker and a fridge. Cutlery and other materials are also available so your snacks, drinks and meals may best be enjoyed. To make the most of your flight, be sure to confirm the aircraft’s facilities. Know more about the specifications of the Gulfstream G2, and schedule for your very own, private flight today. The Gulfstream G2’s standard interiors have passenger seats which can be reclined. These seats may also have corresponding pull out and foldable tables, so you can relish your meals while enjoying some aerial views out the window. The same tables can be used as platforms for your laptops so you can catch up on reading through emails and organizing cloud based documents. In-flight entertainment will also vary depending on the operator’s customized system. To reiterate, it’s always best to confirm your aircraft’s exact amenities so you may plan out your activities while flying on board. As a classic and one of the earliest forms of Gulfstream jets, the Gulfstream G2 has a competitive speed and range capacity among its counterparts. If you’re planning to reach a much farther than usual destination, then it’s best to confirm the number of passengers which can fly with you. Your load details must also include the agreed weight of your luggage. This way, your operator can better jot down to best possible schedules and routes for your destination’s flight plan. 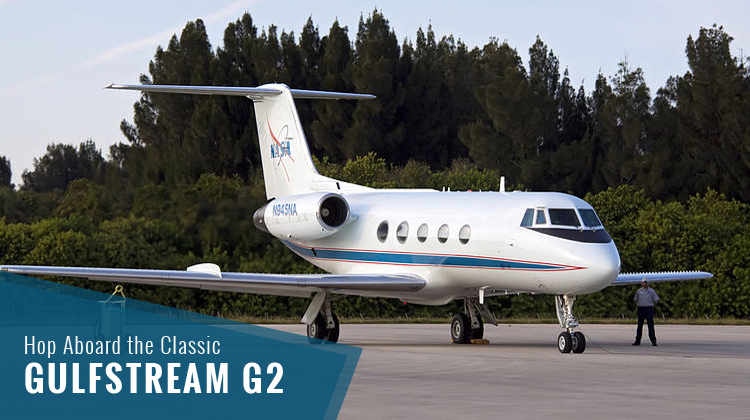 Built by Gulfstream Aerospace, the Gulfstream G2 is known to be among the predecessors of what’s known to be today’s range of Gulfstream jets. The aircraft’s array of oval windows is considered as the latest jets’ ancestor, and this very feature became the manufacturer’s trademark. Fans of flight will always find Gulfstream windows convenient in having the fullest views of the skies. Today, hundreds of Gulfstream G2 units are being flown by various operators around the world.